Paris attraction-guides.com - Paris, France attractions guide featuring Paris, Ile-de-France Basilique du Sacre Coeur de Montmatre information, including location, contact details, opening hours, admission, history and general Paris, Ile-de-France, France FR Basilique du Sacre Coeur de Montmatre information. - Last updated 30/10/2012. 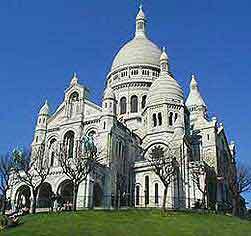 Basilique du Sacre Coeur de Montmatre is dedicated to the Sacred Heart of Christ and the crypt contains what many believe to be Christ's Sacred Heart. This 19th-century basilica towers over Paris and affords wonderful views of the city. Built after the 1870 defeat in the Franco-Prussian war, the Basilique du Sacre Coeur de Montmatre features a magnificent mosaic of Christ.